The global ECG cables and ECG leadwires market is estimated to grow at a CAGR of 5.7% during the forecast period, to reach USD 1.75 Billion by 2021. The rising incidences of cardiovascular diseases, growing geriatric population, and growing technological advancements are major factors driving the growth of the market. However, high cost of the disposable cables and leadwires are expected to limit the growth of this market to a certain extent. In this report, the ECG cable and ECG leadwires market is segmented on the basis of material, usability, leadwires by machine type, patient care setting and regions. Based on material, the market is divided into TPU (thermoplastic polyurethane), TPE (thermoplastic elastomer) and other materials (Silicone, PVC). In 2015, the TPE (thermoplastic elastomer) segment accounted for the largest share in the global market. The large share of this segment is mainly attributed to its higher adoption as the materials have compatibility, strength, and durability. Based on usability, the market is segmented into reusable and disposable. The reusable segment accounted for the largest share in the ECG cable market which is mainly due to its cost efficiency thus most of the developing countries widely utilize reusable cables and leadwires. The ECG leadwires market, by type, is divided into single-lead ECG leadwire, 3- lead ECG leadwire, 5- lead ECG leadwire, 6- lead ECG leadwire, 12- lead ECG leadwire and other leadwires (15- and 18- lead ECG leadwires). 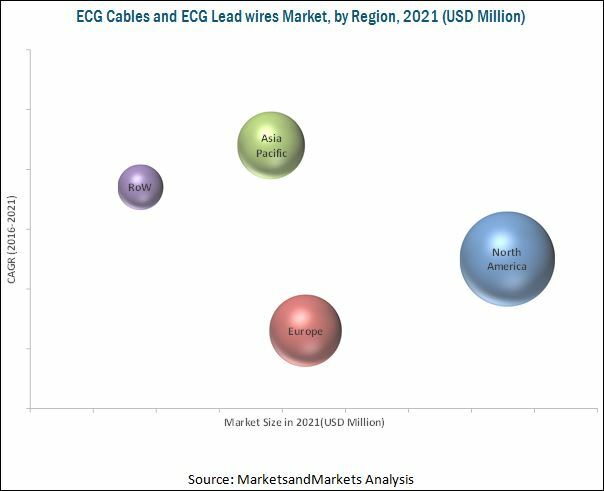 In 2015, the 12- lead ECG leadwire segment accounted for the largest share in the global ECG leadwires market, by type. Based on patient care setting, the global market is segmented into the hospitals, clinics, long term care facilities and ambulatory and hospital care. In 2015 the hospitals segment held the largest share in the market, by patient care setting. Geographically, the ECG cable market is segmented into North America, Europe, Asia-Pacific, and the Rest of the World. In 2015, North America commanded a major share of the market. However, Asia-Pacific is expected to witness the highest growth rate during the forecast period. Growth in the Asia-Pacific market can be attributed to growing aged population, increasing incidences of cardiovascular diseases and disposable income. The prominent players in the global ECG cables and ECG leadwires market include 3M Company (U.S.), Becton, Dickinson and Company (U.S.), Medtronic plc (Ireland), Koninklijke Philips N.V. (The Netherlands) Mindray Medical International Limited (China), Curbell Medical Products, Inc. (U.S.), Welch Allyn, Inc. (U.S.), CONMED Corporation (U.S.), OSI Systems, Inc. (U.S.), and SCHILLER AG (Switzerland). The ECG cable and ECG leadwires market is expected to witness significant growth in the coming years owing mainly to factors such as the rapidly increasing geriatric population, rising incidences of cardiovascular diseases and technological advancements. The global market is projected to reach USD 1.75 Billion by 2021 from USD 1.32 Billion in 2016, at a CAGR of 5.7% from 2016 to 2021. However, factors such as high cost of the disposable cables and leadwires is limiting the growth of this market. The growing favor of government regulations towards monitoring devices is another major factor driving the growth of the market. Increasing focus of the leading players on strategic mergers and acquisitions in both global and regional levels, followed by tapping untapped emerging markets will providing growth opportunities for players in this market. This report analyzes the ECG cables market by basis of material, usability, leadwires by machine type, patient care setting and regions. Based on material, the market is divided into TPU (thermoplastic polyurethane), TPE (thermoplastic elastomer) and other materials (Silicone, PVC). In 2015, the TPE (thermoplastic elastomer) segment accounted for the largest share in the global market. Based on usage, the ECG cable market is segmented into reusable and disposable. The reusable segment accounted for the largest share in the market in 2015. The ECG leadwires market, by machine type, is divided into single-lead ECG leadwire, 3- lead ECG leadwire, 5- lead ECG leadwire, 6- lead ECG leadwire, 12- lead ECG leadwire and other leadwires (15- and 18- lead ECG leadwires). In 2015, the 12- lead ECG leadwire segment accounted for the largest share in the global ECG leadwires market, by type. Based on patient care setting, the ECG cable market is segmented into the hospitals, clinics, long term care facilities and ambulatory and hospital care. The hospitals segment held the largest share in the end user segment due to growing burden of cardiovascular diseases, which in turn is increasing the need for quality cardiology care. The global ECG cable market is predominantly divided into North America, Europe, Asia-Pacific, and Rest of the World (RoW). In 2015, North America dominated the market followed by Europe, Asia-pacific, and the Rest of the World. Growing aging population and demands for remote monitoring in ECG devices are one of the driving factors of ECG cable and ECG leadwires in North America. However, the Asia-Pacific (APAC) region is expected to witness the highest growth during the forecast period. The global ECG cable market consists of a large number of players. Amidst this intense market competition, the major players are constantly focusing on achieving higher market shares through mergers and acquisitions in the market. The major players in the global market include 3M Company (U.S.), Becton, Dickinson and Company (U.S.), Medtronic plc (Ireland), Koninklijke Philips N.V. (The Netherlands) Mindray Medical International Limited (China), Curbell Medical Products, Inc. (U.S.), Welch Allyn, Inc. (U.S.), CONMED Corporation (U.S.), OSI Systems, Inc. (U.S.), and SCHILLER AG (Switzerland). 12.6 Curbell Medical Products, Inc.